Georadar research has been completed on the territory of ancient Monasteries in the Kargopol district (the Arkhangelsk region in Russia). The research was conducted by the preservation of historical heritage “Emperor” fund with support of the fund, “Severny krai” (Northern regions). Work has been carried out in the St. Alexander of Oshevensk and St. Kirill of Chelmogorsk Monasteries, as well as in the town of Kargopol. The researchers believe that results may prove sensational. Metropolitan Daniel of Arkhangelsk and Kholmogory, the head of the administration of the Kargopol district Andrei Egorov, organizers of georadar research, heads of settlements, heads of government institutions and businessmen of Kargopol took part in the press conference devoted to this event. Metropolitan Daniel noted that these ancient places of the north are holy places. “Not so many holy sites have remained in Russia,” said the Hierarch. “And pain remains in the heart. 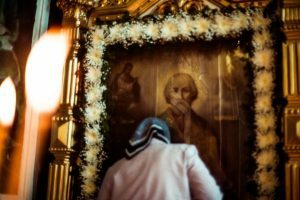 This is the Russia that we have lost… Our first task is to take the Orthodox faith from our ancestors, to preserve it and to pass it on to future generations. When you see that you have failed to preserve it, to pass it on, then you begin to worry for future of the country”. Vladimir Stanulevich, the secretary of the Board of Trusties of the Emperor fund, informed that the results of research in the St. Alexander of Oshevensk Monastery may turn out to be a scientific sensation. “An object has been discovered there and its characteristics require more precise definition. We will get the final answer in a couple of months. We hope it proves to be a scientific discovery not only on the district level, but also on the regional and the national level on the whole,” stressed Vladimir Stanulevich. A number of objects have been discovered with georadar and there is a strong possibility that they are burial sites. It is still impossible to conclude whether or not they are the graves of saints. The Emperor fund of preservation of historical heritage has been actively cooperating with the Arkhangelsk Metropolia. It has carried out considerable scientific research and educational work on the history of Russia’s north in recent times. Georadar research has been performed in Kholmogory, in the St. Antony of Siya Monastery and in the Monastery of Solovki. 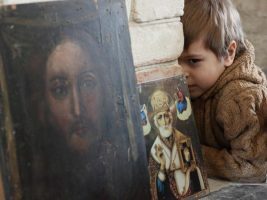 The grave of St. Antony of Siya has been examined, as also have the supposed graves of the saintly brothers, Felix and Antony of Korela in the St. Nikolos of Korela Monastery (now a machinery plant in the town of Severodvinsk) have been discovered as well as the graves of two of bishops of Kholmogory in the Cathedral of Transfiguration in Kholmogory. 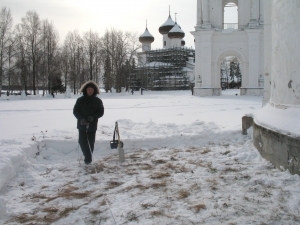 Furthermore, remains of a wooden wall of the Kholmogory fortress and the foundation of the demolished Cathedral of Holy Trinity near the a theatre in Arkhangelsk have been discovered, mass graves in Liavlia and Kommunarka (the Moscow region) and the courtyard of the Solovetsky Monastery have been examined, reports Pravoslaviye na severnoi zemle (Orthodoxy in the Northern Lands).